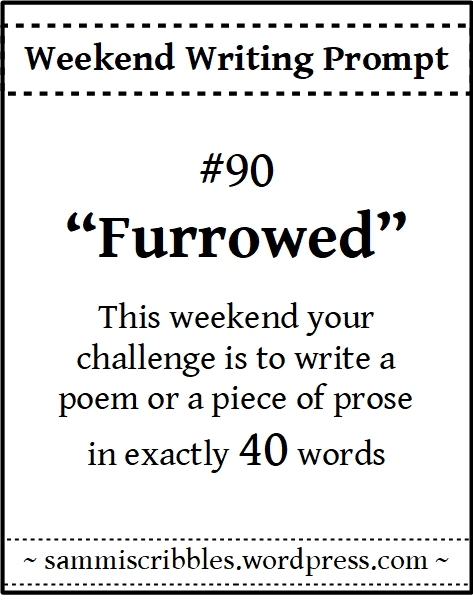 This entry was posted in Love, Weekend Writing Prompt. Bookmark the permalink. Cool pic and great lil’ story. Well done. I’m bundling up as we speak!! Make sure you go to the bathroom first! bwahahaha! Liked this. I put you forward for a Tell a Story challenge, but don’t know if it reached you OK. No problems if it doesn’t appeal. Thank you so much… as for the photo (uh huh, you’re welcome). Glad it came across. I feel the frost. Not sure it’s source. Could be the piccie. Could be the opening remark. Nice words. There’s a lot of pain and history in those few words, well done! Thank you, Andrea… there might have been! Four little words.. Very nicely done Dale. Poignant and a bit funny all at once, with the added photo. Otherwise, it is a painful truth that the furrowed should know! It is a painful truth better acknowledged sooner rather than later. Oh, so it’s a cracked windshield! Well, it seems Frosty had his/her creative way with it! Actually, no, it’s not cracked. 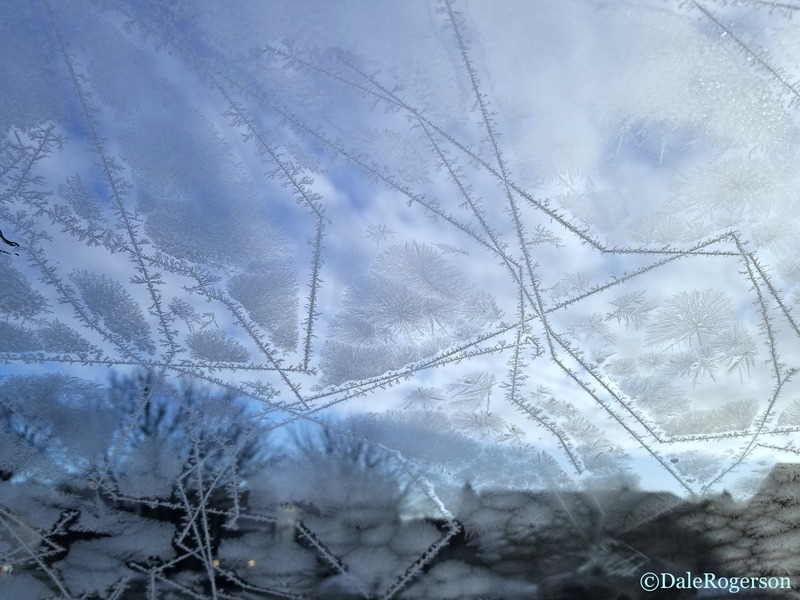 That is a cool ice formation on the inside of the windshield. I could not help but photograph it like that. I have another taken at night which is kinda cool, too. It’s gorgeous! Still, Frosty has some magic fingers! Why thank you, my friend!! Well, that should’a broken any ice …. 😉 Well done! Have fun in the arctic … some of it is heading our way for tomorrow night, me hear. I’m not particularly keen on -15C but that’s what we’re set to be getting (before the windchill factor…). Funny! We each commented on the other’s at the same time! Honest to goodness… was nuts. Oh oh. You KNOW it is bad weather when you’d be warmer inside your fridge. Screw that! I think it’s warmer in my FREEZER! Summer can be hotter than Hades too…. Too bad, you’re not coming to Montreal! Who knows … 😉 There may be some traveling amidst the traveling … I’ll know more when summer approaches. BAM! That quickly hit me right between the eyes, Dale. Well done! Oh how you enjoy those endings that coming out of nowhere! The cracked photo (ice?) is the perfect partner for your words. Excellent. And thank you, I thought so too!! Furrow is another favorite word and put to such heartrending use here! Alas, there is but twilight for the stars that do not settle us. But the twilight is still something to shine on, so there’s that. And besides, there is always the star that you will find, after which all the rest will seem a lesson that became worth the learning. Love that pic too! It looks so familiar! It is a word of many meanings, which I really like. Alas, that is very true. And yes, twilight is wonderful in itself. And if one is looking for that star, may they find. All learnings are good. Thanks. Hmm. Wonder where you saw it before? If it were a book, it would be leather bound and heavy. Yet, worth the read. Definitely worth the read. There are no ‘mistakes’, only moments of learning. This ain’t new age mumbo jumbo, either. It happens to be truer than Jane Austen on a double dose of truth serum. I don’t know! It has me . . wait for it . . wordless! Maybe the heavy part, LOL. Belly buttons are easy to stare at for minutes on end. It resembles alien craftsmanship, and forget about the metaphorical values of such a term as belly button. It’s the beginning, it’s the end . . .
Wednesdays leave me wordless . . . word up! They might be, but eventually you get a crick in your neck and are forced to look up. THEN and only then can you see your itty-bitty part in the grand scheme of things. Well ain’t you sweeter than pie! And Imma take the compliment! Even though the holidays did NOT do a service to me, but that’s okay, I’m back to reversing it. Yes it’s true. Some believe the itty-bitty quality is a negative connotation. Nope, it’s in the itty-bitty that greater things are borne. We shall BOTH disregard the holidays and their nefarious ways of jeopardizing our svelte physiques, knowing we are tackling that issue. And yes, do take it as a compliment. It was meant as such. Nefarious! Yes . . yes they are nefarious with their ways! How dare they vandalize our svelte physiques! It’s the end of the world as we snow it . . .
Wait…no prizes? Not even $3K worth of fast food burgers? Hrumpf. Seriously, all kidding aside…well done. Hrumpf away! What if there were alreadt $3K of burgers given? Oh, the ending… ouch! Such drama in 40 words!